Thanks to fellow blogger Pelle at Blikkendoos.be, I will never forget that the 25th of may is from now on Towel Day. In order to celebrate the festivities, I went for a Vogon-green one. Don’t hesitate to post your pictures of Towel Day madness, but make sure to cut off the parts future employers could use to identify you. Much like I did. 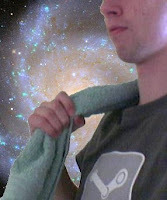 4 Responses to "Towel Day"
Every day is Towel Day with Robbe De Hert! A very valid point ! Towel Day 2009 is approaching… don’t forget your towel!